The grant allowed St. Louis Senior Dog Project to help one of our special-needs dogs get a custom orthopedic brace for his badly damaged front leg. 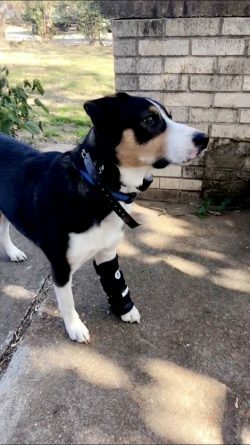 Diesel’s front-leg injury was causing him pain and the orthopedic brace purchased with the emergency medical grant money provided by the Petfinder Foundation has given him comfort and mobility. Diesel is a very sweet 2-year-old Aussie/border collie mix who had a rough start in life. Back in April, Diesel’s owners left him outside for over a week while they were out of town. Scared and alone, Diesel jumped a 30′ retaining wall and shattered his right rear leg and left front leg. 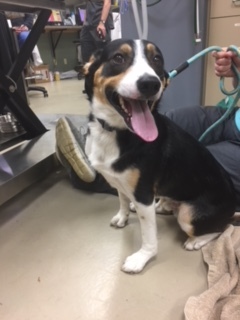 He was picked up by Jefferson County Animal Control and immediately taken to Ivan Animal Hospital for emergency surgery to repair his rear leg. Ivan Animal Hospital attempted to cast his front leg with the hope it would heal on its own. Diesel’s family returned six days later, found out what had happened, and were upset by the outstanding medical bills. Unwilling to pay, they surrendered Diesel to St. Louis Senior Dog Project. He spent a month and a half in the hospital recovering from surgery before transitioning to his foster home. 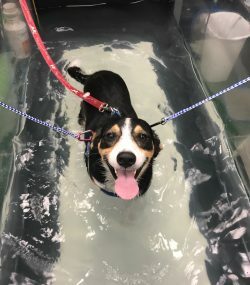 Diesel spent four months undergoing physical therapy to help rebuild muscle mass in his rear leg. The rear-leg fracture has finally healed and the bone is still remodeling. Although his mobility has greatly improved, the vet says that Diesel will never regain complete use of the rear leg. After weighing different options for treatment of the front leg, Veterinary Specialty Services of St. Louis made a custom orthopedic brace for Diesel. Since receiving his new brace, Diesel has been able to go for long walks and his mobility has dramatically increased! A special thanks to the Petfinder Foundation for providing St. Louis Senior Dog Project with emergency medical grant money that enabled us to get a custom brace made for Diesel. Diesel and St. Louis Senior Dog Project greatly appreciate your grant!